The Reverend Homer Jackson Clark was twice instrumental in saving the College from collapse. Born in Mt. Holly, Vermont, on December 23, 1803, he moved to Ohio with his parents in his youth. In his teens he joined the Method­ist Church and was licensed to preach. He received trial membership in the Ohio Conference in 1824 but resigned to attend Ohio University. His record there was such that upon graduation in 1829 he was invited to become an instructor. The secession of the Methodist Protestant Church from the Methodist Episcopal Church saw the latter lose many of its clergy and lay leaders. To stem these defections, Bishop William McKendree sent Clark to Pittsburgh in 1830, where his energy and eloquence won him a following. The next year Clark was appointed to Uniontown and a year later made a professor at Madison College in that same locale. While seeking support for Madison College, Clark traveled to Meadville, where he learned of Alleghany’s outstanding library and fine hall. Party strife and competition from nearby Jefferson and Washing­ton colleges spelled the failure of Madison. Yet the Methodists were sure there was demand within their Pittsburgh Conference for higher education. When Mead­ville trustees sent a proposal to Clark on March 15, 1831, nego­tia­tions began that led to Methodist patronage of the College. Clark, newly the recipient of a master’s degree from his alma mater, was appointed vice president and professor of mathematics and natural science. For nearly a year while Martin Ruter was in Harrisburg, Clark served as acting president. Upon Ruter’s resignation in 1837, Clark was elected president. Amiable and kind-spirited, he gained the respect of the faculty, students, and community for his capabilities as a teach­er and for his industry. He followed a disciplined personal regimen, rising at 4:00 a.m. in the winter, 5:00 a.m. in the summer, retiring at 9:30 p.m., and reserving Tuesday for prayer and fasting. He memorized his noteworthy dis­courses, which were given as pol­ished performances. In his memoirs the future bishop, Matthew Simpson, noted that Clark “was a chaste and eloquent speaker, a man of clear thought and beautiful expression, and was a successful teacher. He was, however, more successful in teaching than in administration.”1 Clark’s work and talents were recognized by Transylvania Uni­versity, which awarded him a Doctor of Divinity degree in 1837. Clark encouraged formation of a course of scientific studies in 1840 leading to the Bachelor of Science degree. A Civil Engineering Pro­gram began and the practice of hiring native speakers to teach modern foreign languages was instituted. The College briefly prospered as enrollment increased. But state aid declined and in 1844 ended. Separation of Erie and Pittsburgh into different Methodist conferences led to a decline in support from the Pittsburgh region, as the College fell within the Erie Conference. 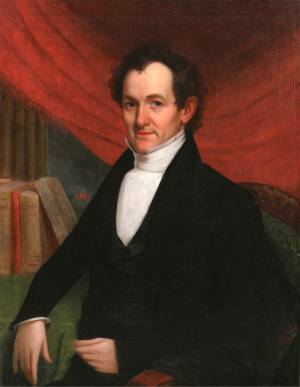 A Perpetual Scholarship Plan proposed by Clark rescued the College from its deficits. He led the campaign for subscriptions while the College briefly closed. The College reopened in 1845 and began accepting the new scholarship students the next year. By 1847 over 200 students were on campus. President Clark’s heavy workload damaged his health. He resigned in Novem­ber 1847. After recuperating on a farm for two years, he accepted pastorates at South Common Pastorate in Allegheny borough and next at Smithfield Street in Pitts­burgh. He served as editor of the Pittsburgh Christian Advocate from 1852 to1856 and then as presiding elder in the Pittsburgh and later the Steubenville dis­tricts until 1864. He died at his Ashland County, Ohio, farm on Sep­tember 24, 1875, widely respected for his character, humility, eloquence, and service. As quoted in Charles H. Haskins and William J. Hull, A History of Higher Education in Pennsylvania. United States Bureau of Education. Circular of Information November 4, 1902. Contributions to American Education History No. 33, ed. by Herbert B. Adams. (Washington, D.C: Government Printing Office, 1902) 15.